This is an excerpt from this weekend’s premium update from the The Financial Tap, which is dedicated to helping people learn to grow into successful investors by providing cycle research on multiple markets delivered twice weekly. Now offering monthly & quarterly subscriptions with 30 day refund. Promo code ZEN saves 10%. It would be very rare for any asset to form an Investor Cycle Low from this type of setup. I know that every secondary indicator I track shows that gold is ready to form a Cycle Low, but from a price and chart perspective, I’ve never seen one shoot higher out of this type of sideways move. I have seen fast drops to retest a Cycle Low, all within the first 10 days of a new Cycle, but none that started off by moving lower like this before rocketing higher. 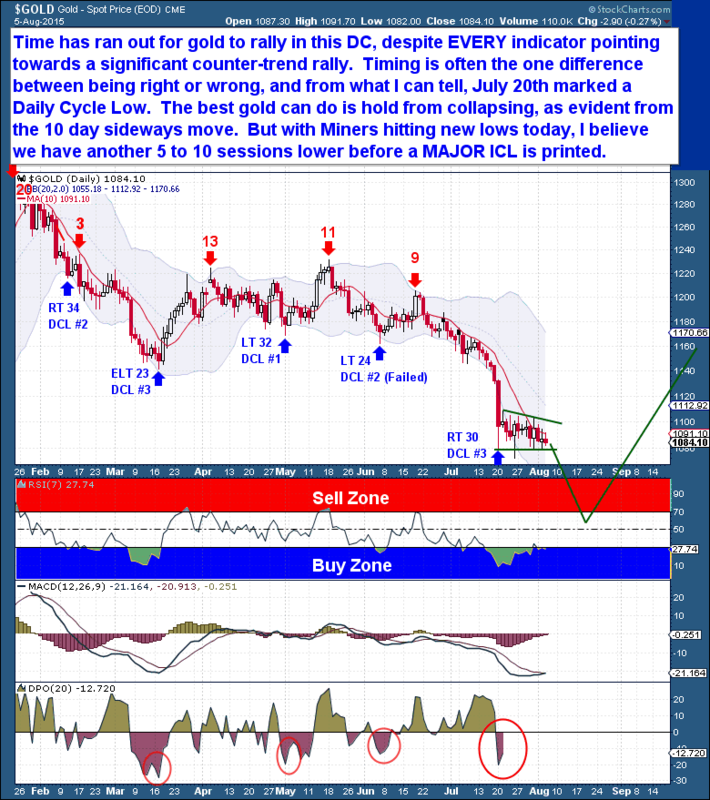 What I believe, which is what I had feared when writing the weekend report, is that time has simply run out for gold to rally in this Daily Cycle. It is clear that there isn’t a bid to support gold, despite EVERY indicator pointing towards a significant counter-trend rally. We know from these depths that it will take an event to trigger a counter-trend short covering rally, but the chart is telling me that event will likely need to wait for one more decline. This is the problem with big Investor Cycle Lows, we need to respect the downtrend before getting too excited about picking a major turning event. It’s the timing that will often be the difference between being right or wrong in a trade, it doesn’t take much to realize that a counter-trend rally is going to come sooner or later. And from what I can tell, July 20th marked a Daily Cycle Low, so my forward expectations are now based off that DCL. The best gold has been able to do is hold from collapsing, as evident from the 10 day sideways move. But with Miners hitting new lows today, I believe we have another 5 to 10 sessions lower, before a major ICL is printed.